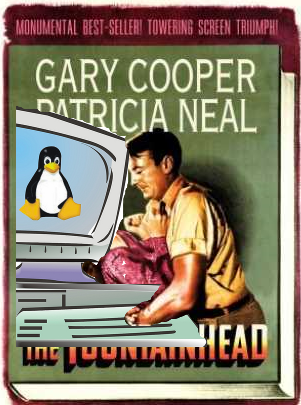 Just watched the The Fountainhead movie from 1946 (yes, from netflix). Open Source is represented by the protagonist, a brilliant architect named Howard Rourke. Rourke is idealistic, does his own thing, is uncompromising, and is not driven by money or recognition – and certainly not by Big Business. Big Business is represented by newspaper magnate Gail Wynand. Wynand wields substantial influence and is in perpetual pursuit of any means to incite the populace – an energized populace buys more product. Talent != influence. Keating’s influence is limited to those who recognize his greatness. Most only recognize as great what they are told to recognize as great. Passion can be directed constructively (Rourke pours his love into his life’s work) or destructively (Wynand devotes his career to controlling the masses through his newspaper). I wonder how many professional software developers identify more with Howard Rourke or Peter Keating? And which is more desirable? A dirty little secret of Eclipse, Linux, Apache and other high-profile projects is that they also have professional, full-time staff – sponsored by Big Business (like IBM) – since the success of these endeavors is strategic for their business. Maybe Open Source isn’t as pure as the romantic notion of developers from around the world contributing since it was a nice thing to do. The world-wide altruistic contributions may still be there in some cases, just supplemented by Big Business. Which is okay with me, though might not be with Howard Rourke. This entry was posted in Essay, Random, Silliness and tagged open source on September 14, 2009 by Bill Wilder.